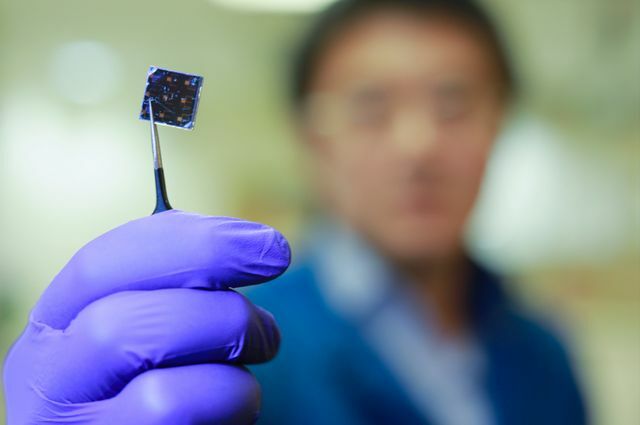 Materials scientists from the UCLA Samueli School of Engineering have developed a highly efficient thin-film solar cell that generates more energy from sunlight than typical solar panels, thanks to its double-layer design. The device is made by spraying a thin layer of perovskite — an inexpensive compound of lead and iodine that has been shown to be very efficient at capturing energy from sunlight — onto a commercially available solar cell. The solar cell that forms the bottom layer of the device is made of a compound of copper, indium, gallium and selenide, or CIGS. The team’s new cell converts 22.4 percent of the incoming energy from the sun, a record in power conversion efficiency for a perovskite–CIGS tandem solar cell. The performance was confirmed in independent tests at the U.S. Department of Energy’s National Renewable Energy Laboratory. (The previous record, set in 2015 by a group at IBM’s Thomas J. Watson Research Center, was 10.9 percent.) The UCLA device’s efficiency rate is similar to that of the poly-silicon solar cells that currently dominate the photovoltaics market. 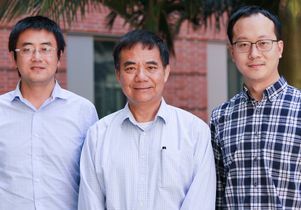 The research, which was published today in Science, was led by Yang Yang, UCLA’s Carol and Lawrence E. Tannas Jr. Professor of Materials Science. The cell’s CIGS base layer, which is about 2 microns (or two-thousandths of a millimeter) thick, absorbs sunlight and generates energy at a rate of 18.7 percent efficiency on its own, but adding the 1 micron-thick perovskite layer improves its efficiency — much like how adding a turbocharger to a car engine can improve its performance. The two layers are joined by a nanoscale interface that the UCLA researchers designed; the interface helps give the device higher voltage, which increases the amount of power it can export. And the entire assembly sits on a glass substrate that’s about 2 millimeters thick. He added that devices using the two-layer design could eventually approach 30 percent power conversion efficiency. That will be the research group’s next goal. 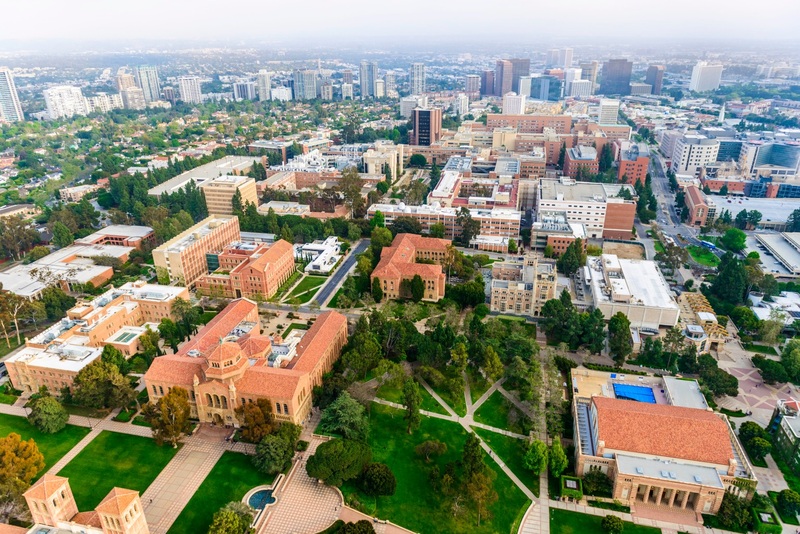 The study’s lead authors are Qifeng Han, a visiting research associate in Yang’s laboratory, and Yao-Tsung Hsieh and Lei Meng, who both recently earned their doctorates at UCLA. The study’s other authors are members of Yang’s research group and researchers from Solar Frontier Corp.’s Atsugi Research Center in Japan.